Happy Monday to everyone out there and make it a great week. Be sure to tune in to That Business Show each and every weekday at 8am on 1250 WHNZ and you can listen live anywhere in the world via the iHeart Radio app on your smartphone or catch us live in studio at http://www.tampabayradio.com via the live stream. 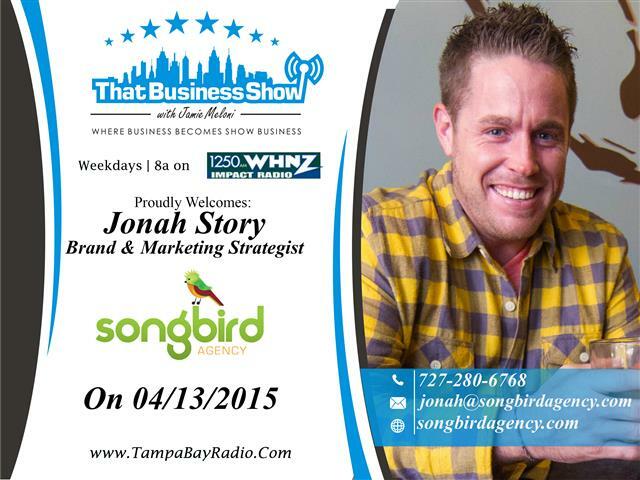 On today’s show, I opened up with Jonah Story, Founder of Songbird Agency. Jonah and his agency are a 5 year old locally based company that specializes in brand and marketing strategy for you, the business owner. Oftentimes we forget the importance of developing a brand and instead focus on doing the work. Remember that many people are attracted to brands and the importance of having a brand strategy cannot be overlooked. Jonah talks about some of the resources and outlets he guides and advised his clients on within their marketing strategy and stresses the importance of not only having a web presence but a strategy for offline presence as well through effective networking and social building skills. Jonah and his company is an experienced agency with 8 people on staff and is not a big-box or freelance organization. They are available to assist you personally with brand and marketing development and can be reached at http://www.songbirdagency.com for more information. Also, you can reach Jonah directly at 727-280-6768 or email at Jonah@songbirdagency.com! On the 2nd half of the show, I had the pleasure of speaking with Lisa Marie Jenkins, Executive Coach, Consultant, and Speaker and author of the book Wake Up Beauty which is available in store fronts across the Country as well as Amazon and her website, http://www.lisamariejenkins.com. Lisa and I spoke of her book and the inspiration for its creation and how women oftentimes lack the confidence necessary to exceed and climb in the workforce despite having a great set of entrepreneurial skills and emotional resources that complement the business goals. Through her consulting and her book, Lisa mentors women on how to effectively navigate these and other challenges within their lives and within the workforce. Lisa is also a blogger for The Huffington Post and tells the story of how she met and spoke personally with Arianna Huffington on getting her blog onto The Huffington Post, a worldwide powerhouse in the news industry. 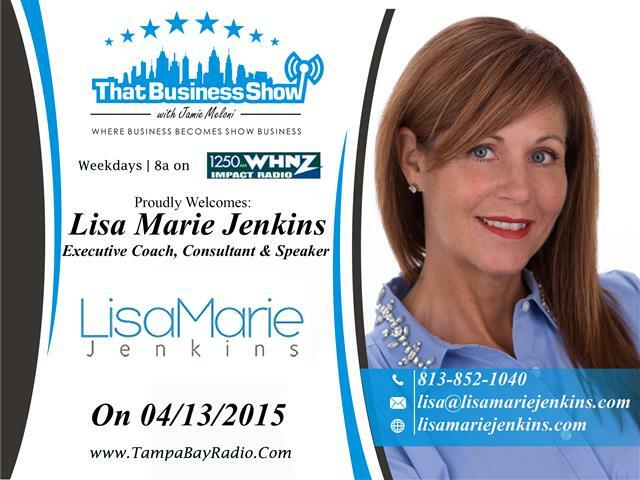 Be sure to catch this great interview and reach out to Lisa through her website at http://www.lisamariejenkins.com or phone at 813-852-1040 for speaking and consulting services. She is also available via email at lisa@lisamariejenkins.com!